The doctor from U of M seemed to lay it out straight — he considers me as currently in remission, No Evidence of Disease (NED)! 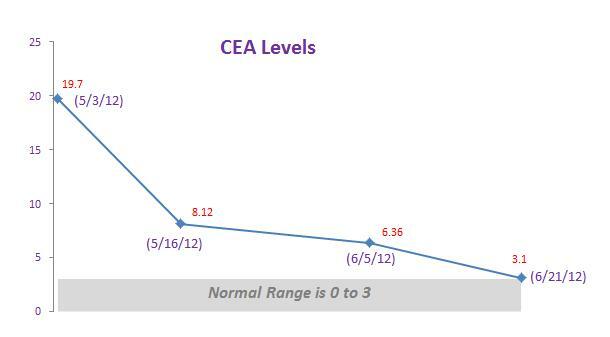 The latest CEA level was 3.1, slightly above the 0 to 3 normal range. An additional test the doctor did was a chest/lung CT scan. As he explained it, the U of M CT scan was a much more granular scan than the Battle Creek hospital had historically done (0.8 MM vs. 5 MM slices). He also warned us that it is not uncommon for the more granular scan to pick up small lung nodules that are NOT cancer – I guess he didn’t want us to panic in the event that he found additional small nodules. The results of this more granular scan = ALL CLEAR, No Evidence of Disease (NED)! 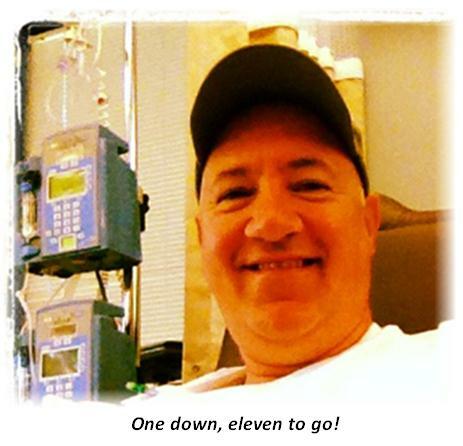 It is important to keep a good perspective when battling cancer. Fighting cancer is more analogous to running a marathon rather than sprinting a mile. That means that recurrences can happen but even if they do happen the war is NOT lost! With surgery as the only treatment (no chemotherapy) the U of M doctor estimated the probability of a recurrence as high (around 70% chance). With chemotherapy the probability of a recurrence would certainly be reduced. However, the amount of the reduction is not exactly known. He extrapolated from studies that are not directly applicable to my case and estimated that with chemo there was a 50% chance of recurrence (therefore a 50% chance of NO recurrence!). If you search the web, stage IV colon cancer five year survival rates are estimated between five to nine percent. You may also read that stage IV colon cancer is treatable but not curable. We asked the doctor about these statistics. The doctor explained that those estimates are based on dated research (ten year old studies). Additionally, most of the research is based on elderly patients who were also suffering from other disease and/or poor health. He did not believe these statistics are current nor are they relevant to my situation. Unfortunately, there just isn’t current data available that directly relates to my case; so in some ways we are sailing in uncharted waters. There are different degrees of stage IV colon cancer. Some cases involve many tumors in multiple organs. Certainly these cases are much more challenging than my situation which involved solitary tumors. We also discussed contingencies. If the cancer recurs there is a high probability that it would continue as a solitary tumor and that it would be treatable with an additional surgery. He stated strongly that he believes stage IV colon cancer CAN BE CURED. And further stated that he believes he can cure me of this disease (between 40 to 60% chance!). So we have placed our trust in this doctor and are following his treatment! Additional topics discussed with the doctor included exercising and eating healthier! I’ll say more about these in a future post. As of 6/28/2012, I have been walking a LOT (even through two surgeries in three weeks). I’ve been eating healthier (fish, chicken, vegetables, fruit, smaller portions, etc.). I’ve lost over 20 lbs. I’ve started chemotherapy treatment. I have you all praying for me! The LORD has been with me every step of the way! Jesus will continue to walk beside me and give me strength! I feel your love and positive energy flowing my way! I thank God for all these blessings! I thank you for your Prayers and Positive Energy and Love! I pray that God will bless each of you and let his Light shine upon you and your families today and forever! Amen! Praise the LORD for giving us this good news so far. Love you Amy! Take good care of that little blessing from heaven. Joseph is a very beautiful little baby boy – you are very lucky. From this day forward I am joining you in your commitment to eat healthy and exercise. Go Team Phil. Lovve the chart and the blog. Peace Brother! Get rid of that cold dear sister. Love you!!! Kathy, your daily text messages full of love and light are very encouraging. I am truly lucky to have met you so long ago (well not really that long ago 🙂 ). you truly are my BFF. Thanks for sharing this most encouraging news! The chart, as all your charts, helps visualize the test results. (Smiling back …) Thanks also for the very helpful explanation you received from the doctor. I’m with Sally…couldn’t imagine an explanation from you without a VERY helpful chart!! I also appreciate that you are sharing your thoughts about your process as well as the medical explanations behind decisions. There are so many of our family & friends dealing with cancer at this time, it is very helpful to gain perspective. God’s presence in your life, positive thoughts, healthy living and the support of your family will definitely carry you through this recovery time. I haven’t met Connie, but I’m so glad you have her in your life. But most of all, I’m glad you have given God charge over you. Miracles are going to happen. I just know it!! Thanks for the update. Sounds like things are moving in the right direction. Lori and I will keep praying for your treatment to go well.